There is one thing that I am not looking forward to: Menopause. I have a co-worker who is living through it and it sounds horrible. One thing that my mom told me is how dry her skin has become so she would use more anti-aging products than before. Vichy realizes how much our skin changes during and after menopause that they have Neovadiol line that focuses what mature skin needs. What happens to our skin after menopause? With time, our skin gets duller and thinner. It’s as though its natural colors start to fade away. It almost becomes invisible! After menopause, skin pigmentation can increase, causing more spots to form and changing your skin’s optical properties so it stops reflecting light. At the same time, blood circulation slows down, and the network of subcutaneous microcapillary blood vessels changes. The skin grows duller and increasingly pale. 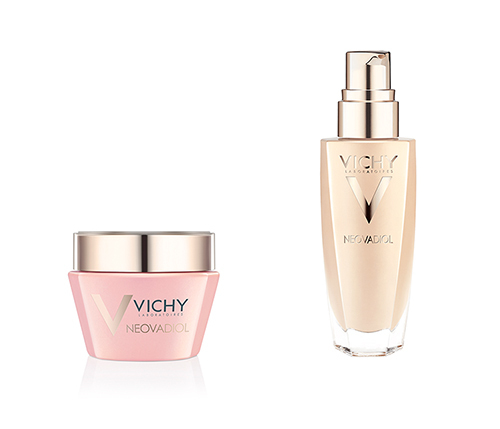 VICHY Laboratoires is happy to introduce Neovadiol Rose Platinium, the first skin cream that nourishes, densifies, and stimulates the natural glow of mature skin. Rich in pigments that have been carefully calibrated to adapt to every skin tone - even ultra-pale ones - this fresh, comfortable cream transforms your skin, now and forever. With its luscious texture and delicate hint of rose, this all-in-one skincare will revive your skin and leave it looking radiant and healthy. It contains Beeswax and Calcuim. Beewax -This natural extract soothes, protects, and nourishes the epidermis and revi-talizes it deep down. Your skin wakes up a little more each day. Calcuim -Enriched with powerful minerals, natural calcium improves the differentiation process in the epidermis, strengthe-ning and improving the corneal layer. At the surface, it helps hold the corneocytes together to fortify the skin’s protective barrier. It gives your skin a real boost, guarding against the passage of time. 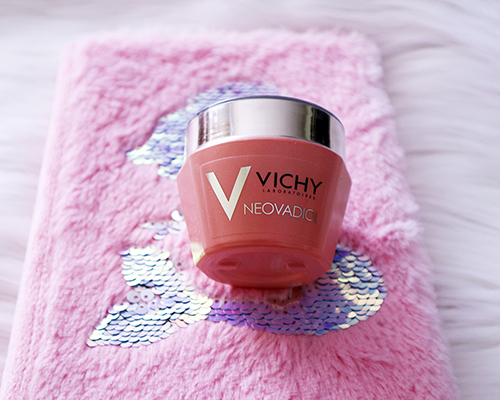 Vichy Neovadiol Rose Platinium comes in a jar so make sure to close it tight immediately after using it to avoid contamination. There is no scent that I noticed. The cream is extremely light and it feels almost like a serum. I noticed there is a shimmer in the cream to give you that glow on your skin. The absorbs fast and does not leave my face feeling tacky or greasy. It feels really great on my skin that I don't want to give it to my mom...too late, she saw it and called dibs on it. Vichy products are available in drug stores and Vichy.ca. Vichy would love to give one of my readers a Neovadiol Rose Platinium ($56.95) and Neovadiol Compensating Complex Serum ($59). This giveaway will run from January 21st to February 18th, 2018 (midnight EST). Winner, You have 72 hours to reply. You must be 18+ Open to Canadians only. Good Luck! Psst - Can't win if you don't answer the mandatory question. I am not responsible for shipping and handling or damages of the prize. The prize is shipped by the Sponsor and they may substitute the prize depending what is in stock. Your information will be sent to the Sponsor for the purpose of shipping out the prize. I am from BC and would like to try the Liftactiv eyes supreme. I am from Manitoba and I would also love to try the MINERAL89. Ontario I would like to try the IDÉAL SOLEIL INVISIBLE MIST SPF 50. It is really hard to find a high SPF. The Aqualia Thermal Rich Cream sounds like it would bring dry winter skin back to life. From Ontario... thanks and happy day everyone. I'm in Alberta and would love to try the Aqualia Thermal Rich Cream. I am from Ontario and I would also love to try the MINERAL89. Manitoba. I love Vichy products, and haven't tried the Aqualia Thermal Dynamic Hydration Power Serum yet. I'm in AB and I would also love to try the Vichy DERCOS NUTRI-REPARATIVE SHAMPOO. I have no experience with Vichy hair products so would love to give them a try. Live in SK and I would like to try the LIFTACTIV anti-wrinkle cream. I'm from PEI and I'd love to try The Vichy Mineral 89 serum. i'm from Ontario. . Been dying to try the Mineral 89 Serum that I've been seeing everywhere! I'm in Ontario. I'd try the LiftActiv Supreme Night. I'm from Ontario and I would love to try anything from the Neovadiol line. I'm in BC and would love to also try the Cellulite and Firming Serum. I’m from Ontario and would like to try LIFTACTIV SERUM 10 SUPREM. I'm from Ontario. I'd love to try the Teint Ideal Highlighting Concealer. I need a bit of illumination under my eyes to hide my dark circles. Im from Ontario and i would also love to try Liftactiv Serum 10 Supreme. I am from Manitoba and would love to try the Aqualia Thermal Rich Cream. I live in Ontario -- I have been wanting to try Vichy 89, and I just bought it!! I live in NB and would like to try the LiftActiv Supreme Night cream. Ontario and would love to try the IDÉAL SOLEIL ULTRA LIGHT LOTION SPF 50.
the Mineral89 looks like a great heavy duty product that I would try. Lori N. Winnipeg manitoba. I'm from BC and I'd like to try the Aqualia Thermal Rich Cream! I'm in BC; the Quenching Mineral Mask sounds like something I'd use. AQUALIA EAU MULSION LONG-LASTING HYDRATION WITH FRAGMENTED HYALURONIC ACID. I am from Ontario and I would love to try the Liftactiv Serum 10 Supreme serum. I'm in Ontario & I'd love to try the Liftactiv Serum 10 Supreme! I am in Ontario and another Vichy product that I would love to try is the Liftactiv Serum 10 Supreme. I am from Alberta. I would like to try the TEINT IDEAL CREAM FOUNDATION. I'm from BC, Canada. I am dying to try Vichy Mineral89, because my skin is very very dry lately. I’m from NS! I’d love to try the Nutri Extra Hands! I am from Saskatchewan, I would love to try the Dercos Mineral Soft Shampoo. I am from British Columbia and I would love to try the Idealia line! The Liftactiv eyes supreme is a product I'd like to try too...I'm from Ontario.